London is home to Big Ben, Queen Elizabeth II is head of state and Shakespeare lived in Stratford-upon-Avon – these are some of the things that most people know about Britain whether they’ve been there or not. But here is a selection of things that you may not know and apart from being interesting facts, they may help to make your England and Wales holidays even more enjoyable. Staying in a historic building need not be expensive. A moated castle, a 16th century manor house, a Dominican friary and a watermill – these are just a few examples of YHA (www.yha.org.uk) hostels which can cost from £12 per person a night. Many have been newly restored: the rambling, gothic manor-house at Ilam in Derbyshire resembles a set from a Victorian costume drama. You can walk freely, off-road, in beautiful countryside. There are 130,000 miles of public footpaths in England and Wales alone. For serious hikers, there are 15 long-distance National Trails (www.nationaltrail.co.uk), the latest being the Cotswold Way (www.nationaltrail.co.uk) through the hills of the same name. The British passion for gardening has influenced the world. The first botanic garden was established at Oxford in 1621 and Lancelot ‘Capability’ Brown was busy landscaping the estates of the rich by 1751. New, 21st century gardens are equally groundbreaking, such as the futuristic Eden Project (www.edenproject.com) with its massive bio-domes in Cornwall, and the National Botanic Garden of Wales (www.gardenofwales.org.uk) near Carmarthen. 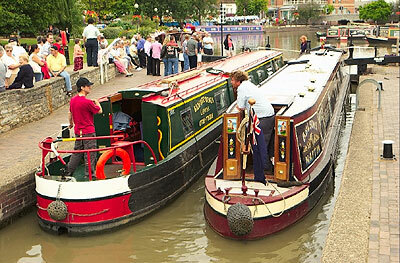 Waterway holidays (www.drifters.co.uk) are a delightful way of seeing Britain. A self-drive narrow boat (no previous experience needed) is a comfortable base from which to explore the 200 year-old canal system at a leisurely pace. Did you know that Birmingham has more canal mileage than Venice! Thousands of Brits open their gardens to visitors for a small fee (donated to charity) once a year, so if you are curious to see how they live – outside at least – scan the National Gardens Scheme’s (www.ngs.org.uk) ‘Yellow Book’ calendar for locations. From Beatrix Potter to Jane Austen, Thomas Hardy to William Wordsworth – no country has more writers’ homes open to visitors. Nothing beats stepping into an author’s home to see what made them tick. This was the northernmost outpost of the Roman Empire and, though Bath’s Roman Bath (www.romanbaths.co.uk) and Hadrian’s Wall (www.hadrians-wall.org) are renowned, there are gems in unlikely places. There’s a Roman gold mine (www.nationaltrust.org.uk) at Dolaucothi in Mid Wales – with tours of the underground workings. One mosaic-filled villa was only unearthed in 1949, at Lullingstone, Kent. You don’t have to go to the coast to take a cruise. 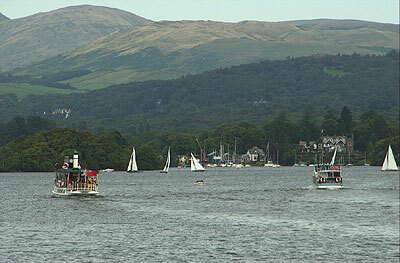 There are regular sailings on Windermere (www.windermere-lakecruises.co.uk), England’s largest lake. On the tranquil upper reaches of the Thames, summer sailings (www.salterssteamers.co.uk) head through ‘Wind in the Willows’ country from places like Windsor and Oxford. We failed in coaxing the sun to come out for a sunnier photo, but nevertheless the scenery is beautiful and the cruise enjoyable. With reputedly haunted buildings scattered throughout the country, it’s not surprising that ghost-themed walking tours are popular. If you love ghostly pursuits, you will find these tours entertaining, although they invariably make you look twice at shifting shadows. 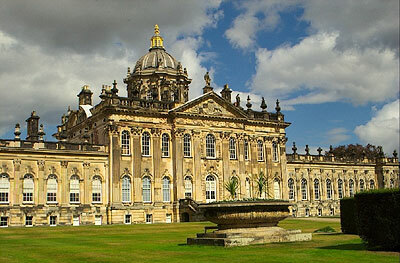 Locations include York, Bath, Lincoln and London. The local tourist offices have details of these. Taking a look at the subjects of the country’s weird and wonderful museums, you’ll realise why Britons have a reputation for being eccentric. There’s the British Lawnmower Museum (www.lawnmowerworld.co.uk) (Southport), the Bakelite Museum (www.nothingtoseehere.net) (Williton, Somerset) and, for a nostalgic collection of packaging, venture to the Museum of Brands, Packaging and Advertising (www.museumofbrands.com) in London’s Notting Hill.